"The historical relationship between CPI and the yield on the 10-year note tells a more ominous story. Since 1947 CPI recorded an average year over year increase of 4.39% while the 10 year averaged 6.16%, implying the yield on the 10-year traded at an average premium of 1.77% over CPI." But as the popular saying goes, "we can find a statistic for anything" as the analysis below shows. "History offers no solution to the interest rate debate, as it supports both rising and falling yields. The U.S. economy grew by 6.39% annually since 1947. During that same period, the yield on the 10-year note averaged 6.16%." With the most current year's GDP of 2.93%, this suggests the 10 year should be closer to 2.7%, slightly lower than the 2.9% today." And let's not forget about a third wrinkle in the yield uncertainty, the upcoming budget and deficit debates that are sure to have U.S. Treasuries (SHY - News) front and center on the world stage. Some estimates suggest the U.S. will run out of money by October 1 if a new budget and debt limit is not in place. Two weeks later, defaults could follow. In that article I suggested hedging a rising yield curve by purchasing the iPath Treasury Steepener ETN (STPP - News). So far so good, as STPP has risen from around $39 to over $41 since then. More aggressive traders might want to look into the iPath 10 Year Bear ETN (DTYS - News) which moves inversely to the 10 year bond price. If yields rise, then the 10 year price will fall and DTYS will appreciate. Another bearish bond exchange traded product is the ProShares UltraShort 20+ Year Treasury (TBT - News). Muni bonds are wrongly getting lost in the debt debate shuffle as Treasuries (TLT - News) remain the major focus. But municipal debt too should be front and center, especially with Detroit's recent fiasco and Puerto Rico's general obligation bond yields recently topping 10%. 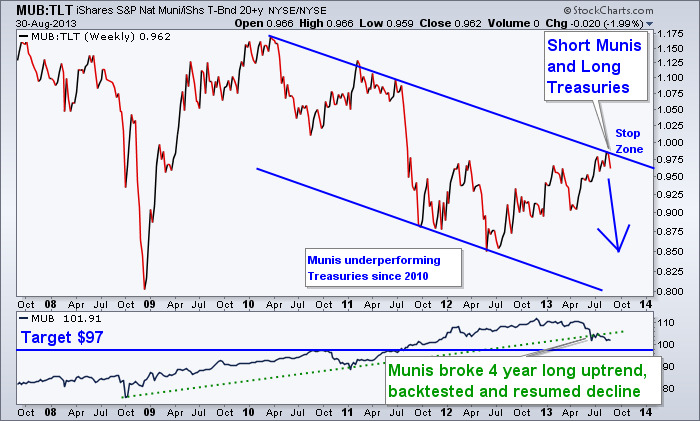 The top portion of the chart shows that since 2010 munis, as measured by the iShares National Municipal Bond Fund (MUB - News), have been underperforming Treasuries. This chart helps identify strength versus weakness and suggests a resumption of the weakness in Muni bonds when compared to Treasuries. Based on the chart, Muni bonds should now start to really underperform Treasuries. LISTEN: Is the Worst Really Over for Gold and Silver? There's another key element to big problems ahead for municipal bonds. A continued rise in yields (HYD - News) would send MUB down significantly more than Treasury Bond ETFs such as TLT or the iShares Barclays 7-10 Year (IEF - News) and thus would make the short MUB, long Treasuries pairs trade profitable. Another way to protect from rising yields is purchasing the iPath Treasury Steepener ETN (STPP - News). ETFguide uses fundamental, technical, and sentiment analysis to stay ahead of the market's trends through our popular ETF Profit Strategy Newsletter, Weekly Picks, and Technical Forecast. The Muni bond market may just be getting started in its decline, and if Treasury yields continue to rise, it will only pressure municipalities who already have too much debt.